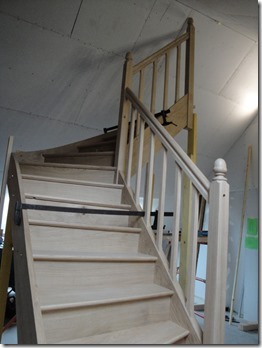 Here’s a beautiful first time stair hand made by Bernard of Chalon in France. 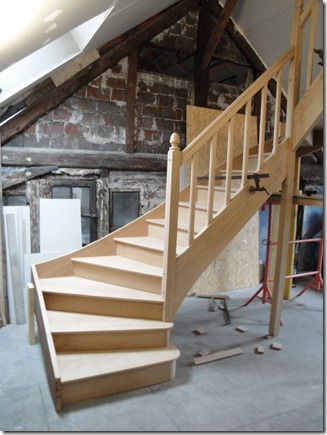 Bernard has used StairDesigner with our StairFile service to design the winder stair. With StairDesigners DXF plans and a little coaching, Bernard has managed to build a beautiful stair that’s far from being a simple basic design. Note that because he wasn’t able to find a big sized printer, Bernard has preferred to use ordinate dimensioned plans rather that full-size paper templates. This method of marking out the parts using ordinate dimensions from a fixed “0” point makes marking up the parts fast and precise. I often use this method when I don’t want loads of paper flapping around the workshop. Of course with a CNC, paper templates and marking out are things of the past, but for small workshop and amateurs marking up whether it be with paper templates or dimensioned drawings is not only efficient but an enjoyable and satisfying part of the job. Note that for someone who’s not used to building stairs understanding the mark up process is the only way to fully understand how to build winder stairs. 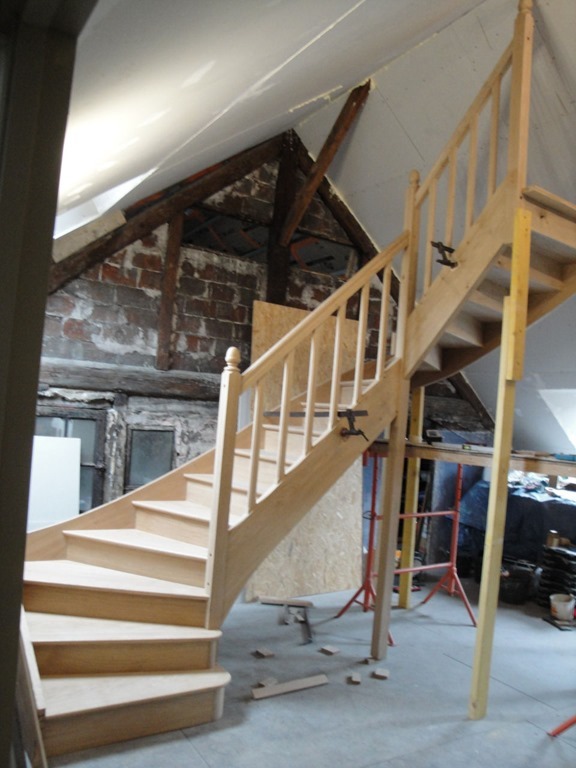 Between stays in Canada, Spain, Alsace, and my golf competitions, I’ve been working on my stairwell and built my stair. Thanks for your precious advice that have been very helpful. 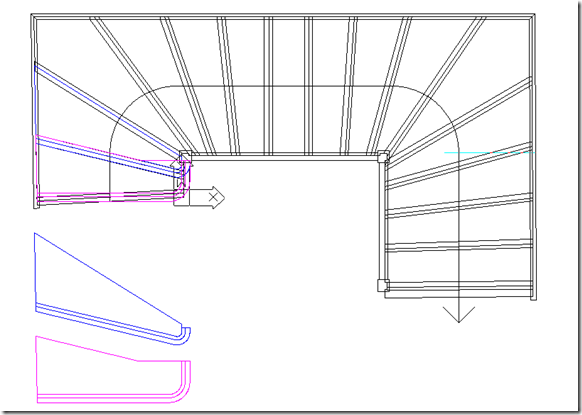 The plans in DXF and the ordinate dimensioning has been a real life saver. I hardly had any adjustment to do when putting the stair together. I love the rounded ended starter steps, and they really add a nice effect to the stair. 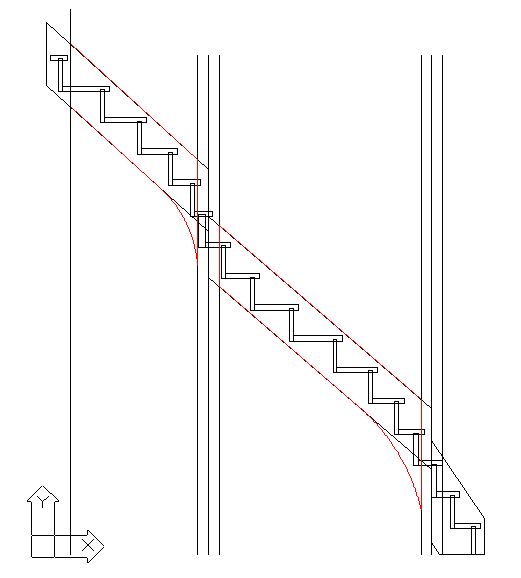 Plan of the stair, drawn using the StairDesigner DXF export function. 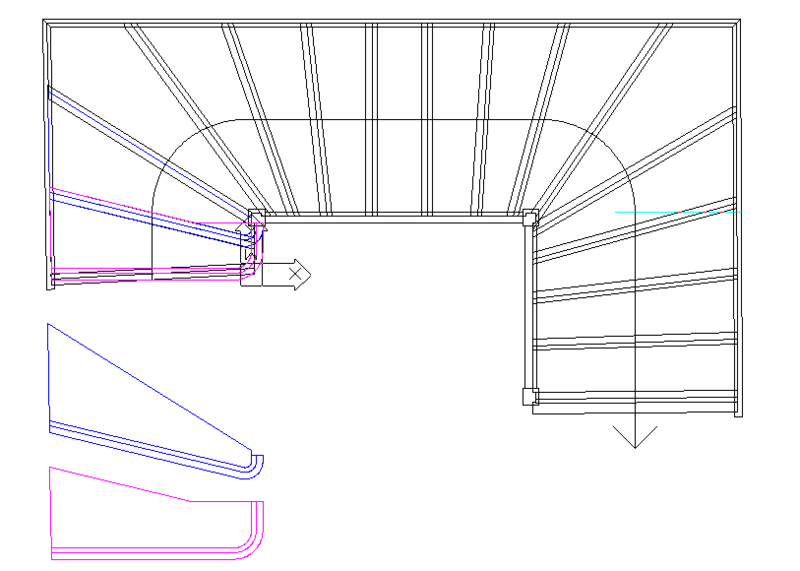 The first and second steps have been modified using Progecad to draw over the StairDesigner plans. 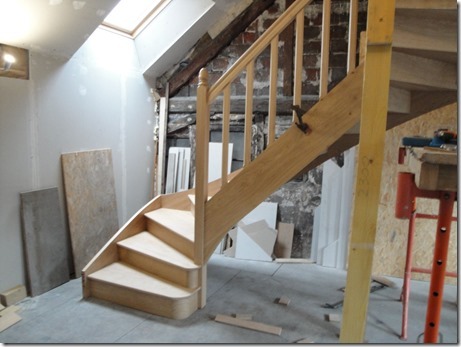 This way of designing a stair with StairDesigner and CADD allows us to create practically any design fast and easy. Here’s the first step dimensioned using ProgeCad and it’s ordinate dimensions. Ordinate dimensions are great for marking out stair parts. They leave the drawing clean and uncluttered. Marking out from a drawing is very quick and precise. If the original board is right angled it’s easy to just leave the tape measure on one edge and mark off all the X dimensions, move it to the next edge and mark off all the Y dimensions. 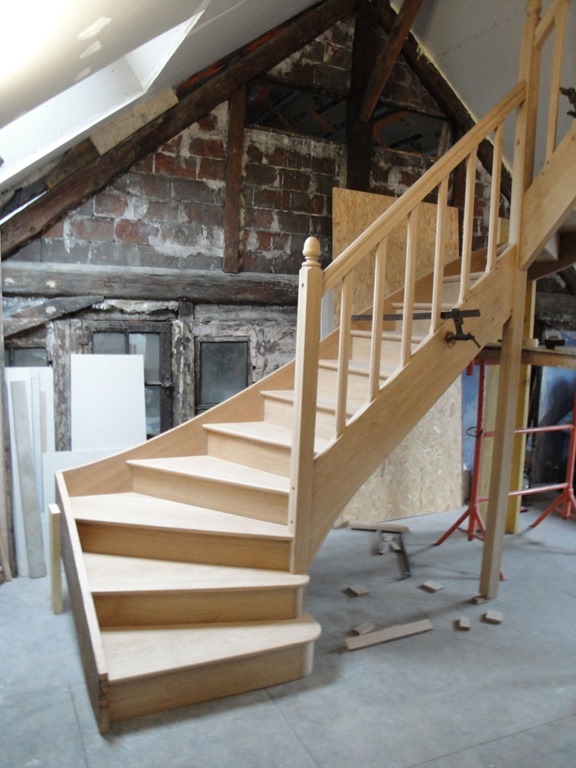 If you don’t want to have to mark up and cut the parts you can also send your StairDesigner plans directly to Gareth Ellis of MTM interiors (now Welshpool Kitchen Company) who will use your plans to machine the parts on his CNC a great new service that you can see on his website. To optimise materials and the cutting of the stringers, Bernard has opted to have straight out side stringers and hand rails. However, to maintain a smooth flow on the winders around the newels the stringers have been slightly modified by adding a curved triangle at their assembly point with the newels to accommodate the extra winders. 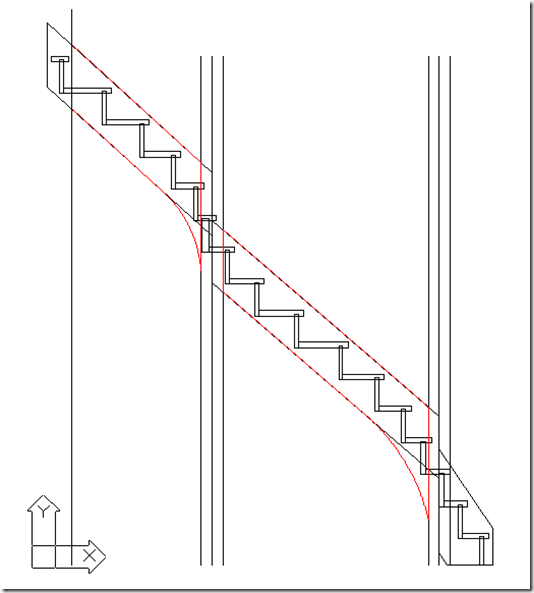 This modification was drawn directly onto the StairDesigner DXF plan and can be seen in red in the drawing below. 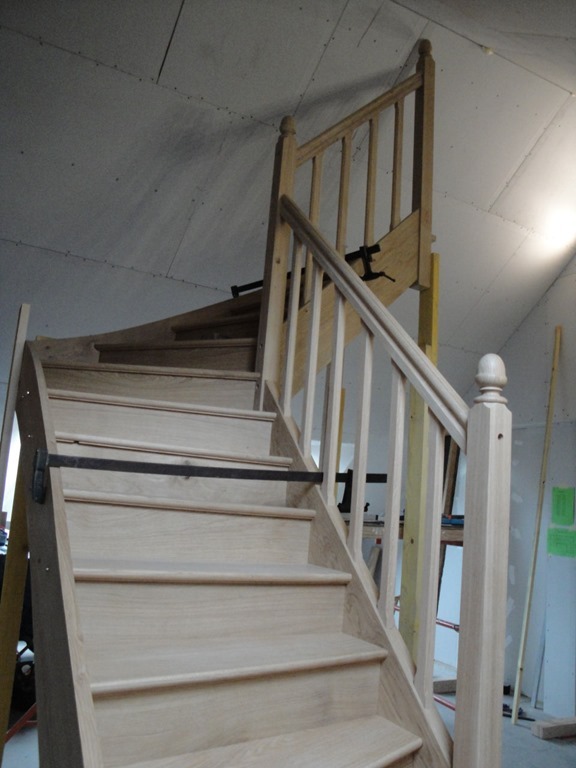 Here’s a photo of the string with it’s step and riser housings routed.Note the joint with the newel post using dowels and coach screw bolts. This is by far the fastest and easiest way to assemble the string and hand rail with the newels. A big thank you to Bernard for this article and his photos! 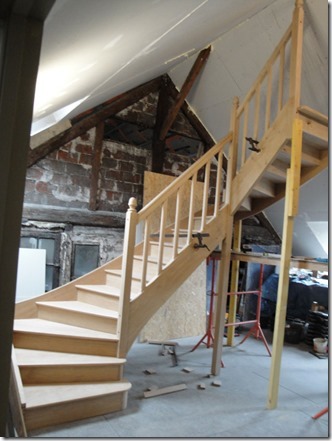 Click here for more details on StairFile, our free stair design software service. If you want your stair parts machined up ready for assembly just send your StairDesigner plans to Gareth Ellis at the Welshpool Kitchen Company. 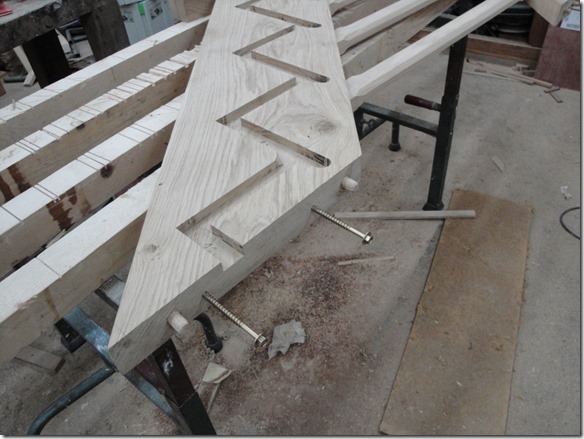 Is that stringer one piece wood , it seems so on photo , isnt it going to bend later , or even crack ? They do not crack or bend if they are well seasoned. Solid wood stairs should be kept inside. Intense variations in humidity will result in cracking . So I never recommend solid wood for outside. Scandinavian houses should be non different that others. I have seen solid wood stairs 100s of years old in houses without central heating in perfect condition. As long as there is no water running onto the wood. Once a roof starts leaking onto the stair the wood will split and start rotting. Nowadays people tend to heat up houses so extremely at winter time that air has basically no humidity and no heating at summertime with high humidity , wondering what could happen if i make it one piece stringer about 300mm wide pinewood plus thin laminate of oak. thank you for quick helpful answers !